This tells how you can order a custom-made lampshade. First, pick out what arcs/frame size, color, and trim that you would like. 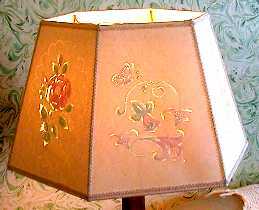 Then, send an email to us for a price estimate telling the details of the lampshade and the type of image desired (from a photo or fabric pattern or words,etc.). We will send an email back with the price estimate and a time of shipping estimate. Full payment is required in advance. Call with a master card or visa credit card number, send a check for the full amount to Marie Bauman, 5103 Route 6, Troy, PA 16947, or use paypal. The lampshade should be shipped within 60 days depending upon order workload.